If you’re going to fly to the other side of the globe to find paradise, you don’t want to have any regrets. 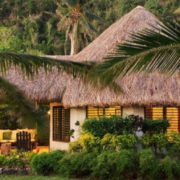 This Fiji vacation package will take you to the most secluded and pristine island locations in the world, and will put you in bures so luxurious that you almost won’t want to come outside to admire the view. On a horseshoe-shaped island, the sparkling water emerges through the inlet between two lush peninsulas to greet you on your private beach. 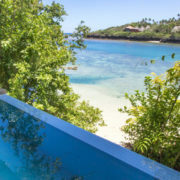 At your split-level bure, your elevated infinity pool looks right out onto the most exquisite beach and azure ocean, stretching utopia from the blue horizon all the way to the warm waters you’re basking in. 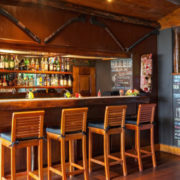 Gourmet meals are complimentary, cold drinks are brought right to your hand, and heaven belongs to you alone. 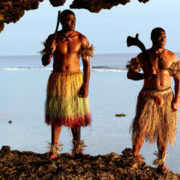 Fiji vacation package is flexible and can be tailored to suit your needs. 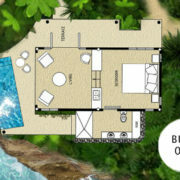 Suitable for 3 Couples, 2 Couples & 2 Children, 1 Couple & 3 Children, Etc. 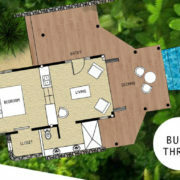 As seen on The Travel Channel "Tremendous Treehouses"
You’ll fly internationally across the date line on your way to Fiji. 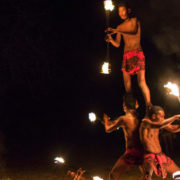 Your Fiji travel specialist will help you add the best flights to this itinerary. 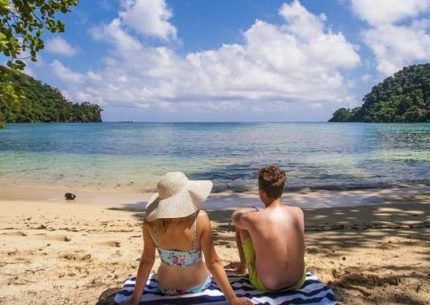 A 50-minute domestic flight will take you from Nadi to the island of Savusavu. 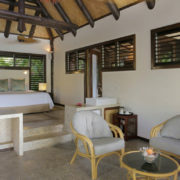 Where your resort will kindly welcome you and take you to your accommodation. 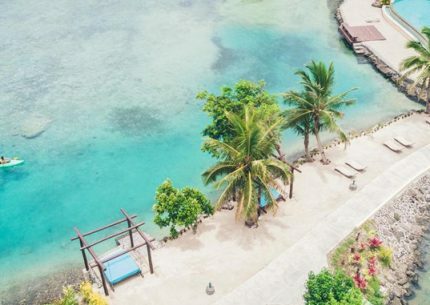 From the pristine beaches to the crystal-clear waters, from the rain showers to the private balcony infinity pools, you’ll feel the essence of luxury. Exquisitely crafted meals are all included and are sure to tantalize your taste buds. 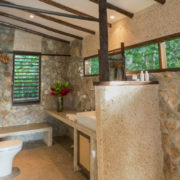 Your upper-level verandah is surrounded by jungle on one side and opens up to views of the picturesque sea that look like something from a fairytale. 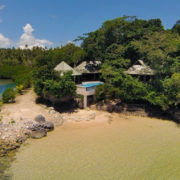 With only 7 villas surrounded by vast tropical vegetation on a 52-acre private island, you’ll feel totally alone in the world in a dreamland setting. The only thing better than paradise is having it all to yourself. This is better than paradise. While you’re invited to try out our standup paddle boards and kayaks, many of the greatest adventures are merely witnessing the miracles of nature that surround you. Take a walk across beautiful tide pools where the incoming tides result in blowholes that spout water into the air like geysers. 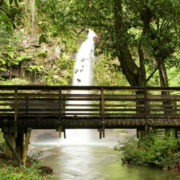 Explore the volcanic outcrops and majestic waterfalls that make up the island. 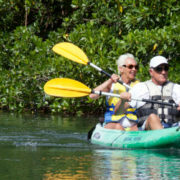 The most popular excursion will take you by kayak down the Qaloqalo River past dense mangrove forests before it opens to the impressive 100-acre Salt Lake. 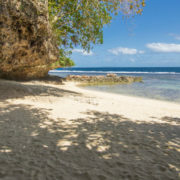 Moonlight snorkeling, dolphin encounters, Fijian cooking classes, and even mud crabbing are all potential excursions that will make this a trip that will never be forgotten. 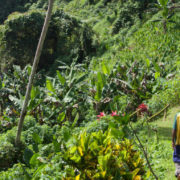 Two short domestic flights will land you in Taveuni with a brief stop in Nadi. 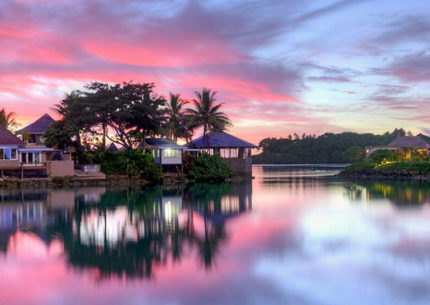 From there, a private car and boat ride will land you an adults-only private island resort. 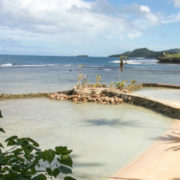 Your new home has made the top of several lists, including “1,000 Places to See Before You Die,” “Top Five Most Romantic Resorts in Fiji,” and “Best Private Island.” On this horseshoe-shaped romantic haven, you’ll be staying in the finest of luxury accommodations surrounded by a laid-back relaxing atmosphere. 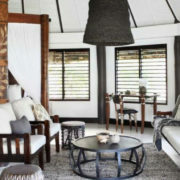 While the coconut palm thatched roof and colorful surrounding foliage make this look just like a large island hut, the interior boasts the absolute height of luxury. 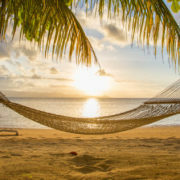 Elegant furnishings, a hammock on a private verandah, a cozy four poster king-size bed and even a daily supply of freshly baked cookies will make you feel like island royalty. 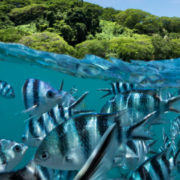 Venture out into the heavenly waters by kayak, standup paddle board, or Calypso catamaran – or simply don a snorkel and mask to see the majestic world that exists beneath the sparkling ocean surface. 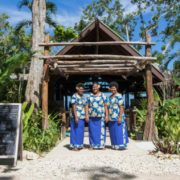 Handline fishing, bush hikes, village tours, church visits, kava sessions and coconut shows are all complimentary and enticing ways to spend your days. Slide down the Waitavala Water Slide where volcanic activity has smoothed the rocks over and provided a natural chute through the rainforest. 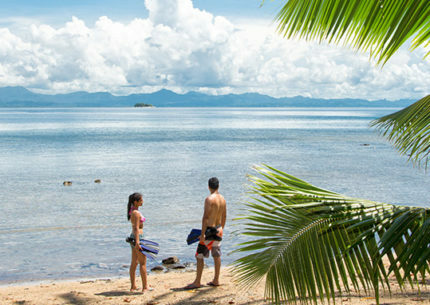 Additional activities include sport fishing, pearl farm tours, waterfall visits, and picnics on Horseshoe Bay. 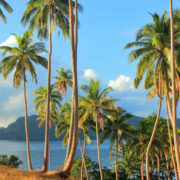 You’ve traversed the globe to find the perfect couple’s getaway. Now take just one more step to achieve ultimate romance. This package will start you off with a private picnic on Horseshoe Bay. 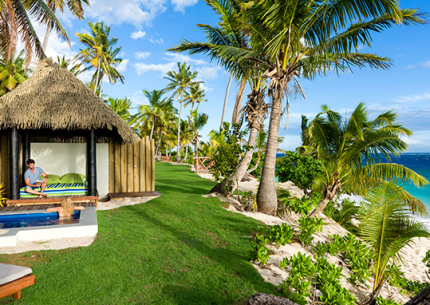 Here, two lush green peninsulas stretch toward each other where the water as blue as the sky makes its way in toward the white sand beach. This beach will belong only to the two of you. 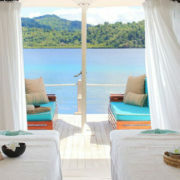 From there, you’ll enjoy a 30-minute couple’s Bobo massage in your resort’s Ocean Spa that is the absolute pinnacle of tranquility. 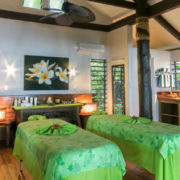 Your massage tables face outward to the blue ocean as your masseuse melts every ounce of stress from your muscles. Finish off the day with a private candlelit dinner under the moonlight in the most romantic setting imaginable. 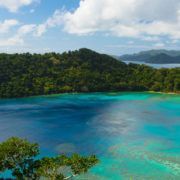 The intricate and glowing coral reefs and the beautiful marine life you’ll see at any of the surrounding dive sites are made just that much better by the fact that the warm waters don’t necessitate uncomfortable wetsuits. World-famous sites like Great White Wall and Noel’s Wall are incredibly unique habitats that inhabit some of the rarest and most remarkable species of marine life. If you can believe it, the world beneath the surface is just as breathtaking as the one above. 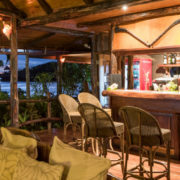 A private car and boat service will bring you back to Taveuni, where you’ll take a short domestic flight to Nadi International Airport. Here, you’ll take your international flight/s home.